The leader of the UK Conservative MEPs says stridently Eurosceptic opinions give the wrong impression that Britain is one against the rest in the EU. Speaking in a debate in London, Richard Ashworth MEP said "we're making ourselves look pretty darned unattractive" as a partner in the EU. UK Chancellor of the Exchequer George Osborne has not ruled out a British exit if the EU fails to reform. Many Conservatives want a straight "in-out" referendum on the UK's membership. 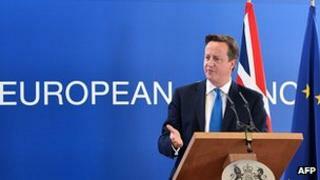 Prime Minister David Cameron is expected to make a key speech on the UK's role in Europe on 22 January. He has not yet given details about the speech, but there is speculation that he will propose a referendum, to be held after the UK election in 2015. Referring to the Conservative ambition to repatriate various powers from Brussels, Mr Ashworth said "an evolutionary solution" was the way to proceed, not "the nuclear option" of withdrawal. He warned that strident Euroscepticism was giving the impression of a Britain "snarling like a pitbull across the Channel". He went on to say that a lot of nations were on the UK's side, including Sweden, Finland and Denmark. In recent days senior politicians in the US and Germany have warned against Britain leaving the EU. But Chancellor Osborne did not rule out a British exit in an interview with Germany's Die Welt newspaper on Friday. "I very much hope that Britain remains a member of the EU," he said. "But in order that we can remain in the European Union, the EU must change. "The British people are very disappointed with the EU and people have the feeling that too many decisions are made too far away in Brussels. Our citizens are asking themselves if Europe can really solve their most pressing problems and create jobs and prosperity." Mr Cameron's coalition government is now studying areas of EU legislation where the UK may be able to claw back powers. One of its chief concerns is to ease the regulatory burden on small businesses, especially the Working Time Directive and other EU labour and welfare legislation. The government is also considering activating a clause in the Lisbon Treaty that allows the UK to opt out of areas of EU justice and policing next year. Conservative MP Andrea Leadsom is involved in that review, called the Fresh Start project. Speaking in Friday's debate, organised by the pro-EU lobby group Business for New Europe, she said the UK "needs to be at the heart of the EU", but also "needs to articulate a new relationship" with its EU partners. She said it would be feasible to negotiate a new "multilateral" arrangement on justice and policing with the rest of the EU, though conceded that it could be difficult. A leading Conservative Eurosceptic MP, Bill Cash, told the debate participants that "the people don't know what they've got in terms of legislation" from the EU. "There hasn't been a focused debate on the pros and cons [of EU membership] since 1975." He said even the widely praised EU single market was "not working, because new things have been added, increasing the burdens on business". In the debate former Labour Party leader Lord Kinnock attacked the Conservative drive to repatriate powers from Brussels. He served as an EU commissioner from 1995 to 2004. He said he doubted whether the Nordic countries, with their generous social welfare, would accept the UK unilaterally diluting workers' rights and still remaining in the EU single market. That would distort the market's level playing field, he argued. He also dismissed the idea of a special "multilateral" deal on justice and policing for the UK, saying the EU had no mechanism to do that. Such changes in the UK's relationship with the EU would have to be negotiated with the other EU countries.